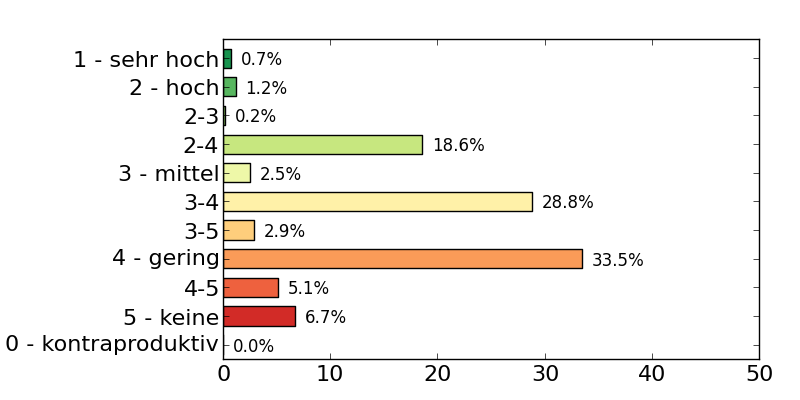 SUMO offers a wide range of outputs, but one may find it hard to parse and visualize them. Below, you may find some tools that allow to visualize a simulation run's results for being included in a scientific paper. Additional tools read plain .csv-files and were added to the suite as they offer a similar interface. All these tools are just wrappers around the wonderful matplotlib library. If you are familiar with Python, you must have a look. The tools share a set of common options to fine-tune the appearence of the generated figures. These options' names where chosen similar to the matplotlib calls. 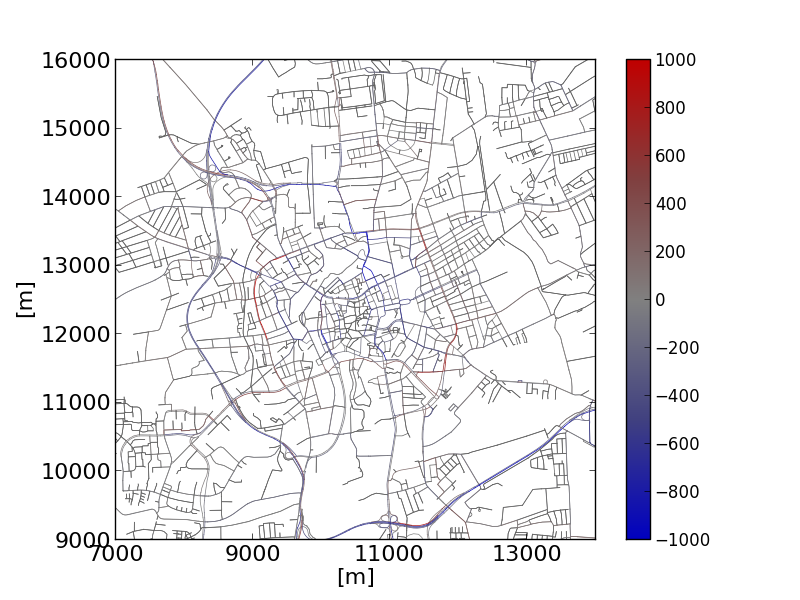 The tools are implemented in Python and need matplotlib to be installed. The tools can be found in <SUMO_HOME>/tools/visualization. All scripts are executed from the command line and you have to give the command line options as listed in the descriptions below. Please note that #common options may be applied to all the scripts listed in the following sub-sections albeit few options may not work for certain scripts. 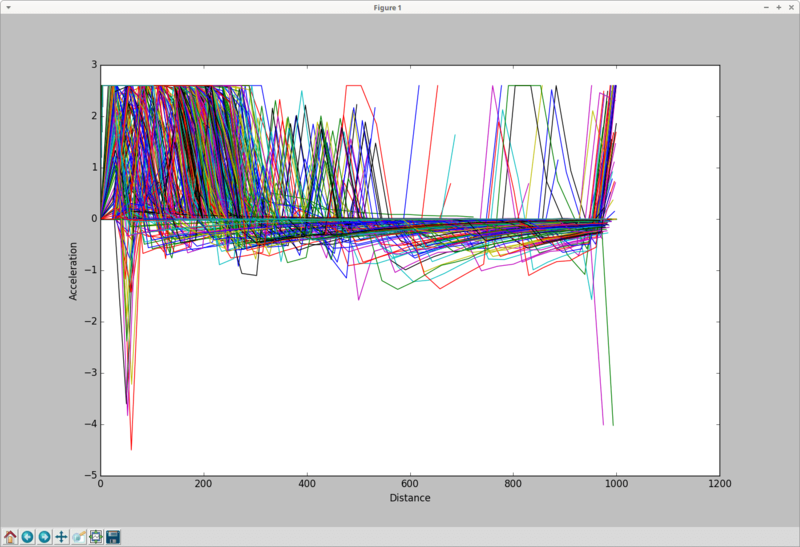 Show plots for all trajectories in a given --fcd-output file. When option -s is set, a interactive plot is opened that allows identifying vehicles by clicking on the respective line (vehicle ids is printed in the console). Option --filter-route EDGE1,EDGE2,... allows restricting the plot to all trajectories that contain the given set of edges. plot_net_dump.py shows a network, where the network edges' colors and width are set in dependence to defined edge attributes. The edge weights are read from "edgedumps" - edgelane traffic, edgelane emissions, or edgelane noise. It shows the shift in traffic in the city of Brunswick, Tuesday-Thursday week type after establishing an environmental zone. Showing the according changes in NOx emissions. Look, all these scripts have capabilities for being improved, this one especially. both, --dump-inputs <FILE>,<FILE> as well as --measures <STRING>,<STRING> expect two entries being divided by a ','. The first is used for the edges' color, the second for their widths. But you may simply skip one entry. Then, the deafult values are used. plot_net_selection.py reads a road network and a selection file as written by SUMO-GUI. 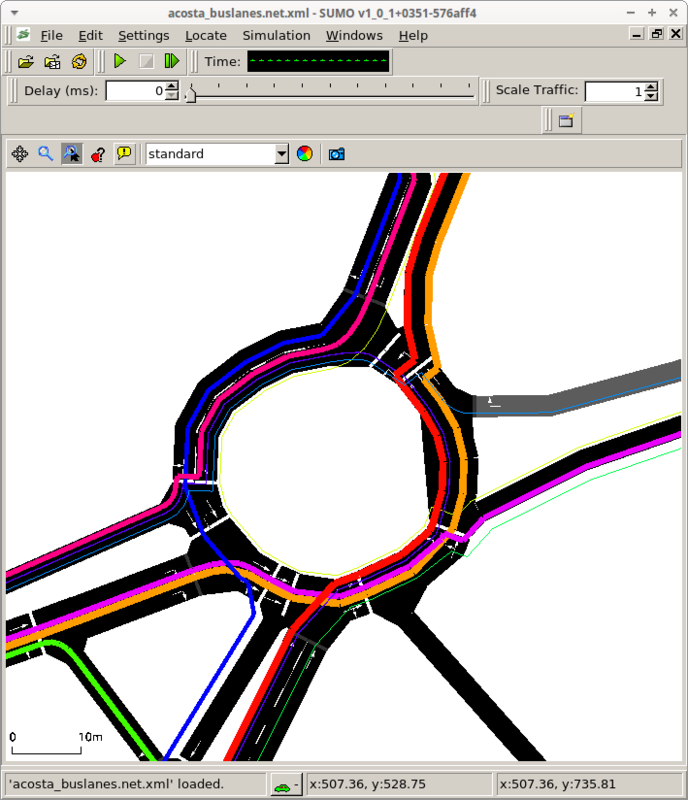 It plots the road network, choosing a different color and width for the edges which are within the selection (all edge with at least one lane in the selection). The example shows the selection of an "environmental zone". 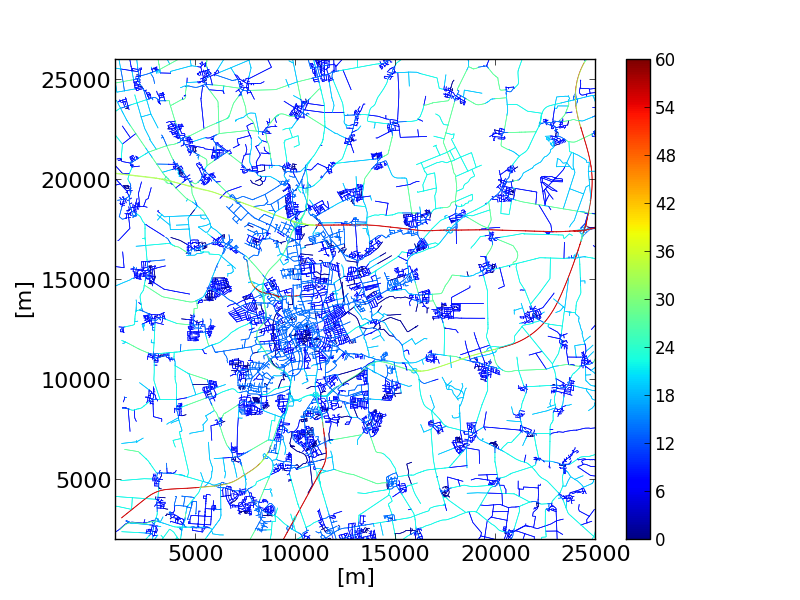 plot_net_speeds.py reads a road network and plots it using the allowed speeds to color the edges. It is rather an example for using measures read from the network file. The example colors the streets in Brunswick, Germany by their maximum allowed speed. plot_net_trafficLights.py reads a road network and plots it and additionally adds dots/markers at the position of traffic lights that are part of the net. The example shows the traffic lights in Brunswick. plot_summary.py reads one or multiple summary-files and plots a selected measure (attribute of the read summary-files). The measure is visualised as a time line along the simulation time. 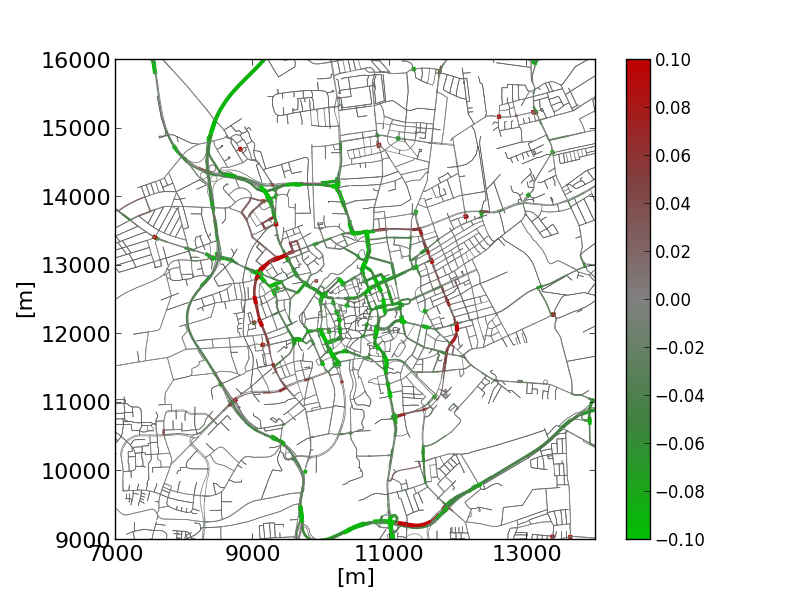 The example shows the numbers of vehicles running in a large-scale scenario of the city of Brunswick over the day for the standard week day classes. "mo.xml", "dido.xml", "fr.xml", "sa.xml", and "so.xml" are summary-files resulting from simulations of the weekday-types Monday, Tuesday-Thursday, Friday, Saturday, and Sunday, respectively. 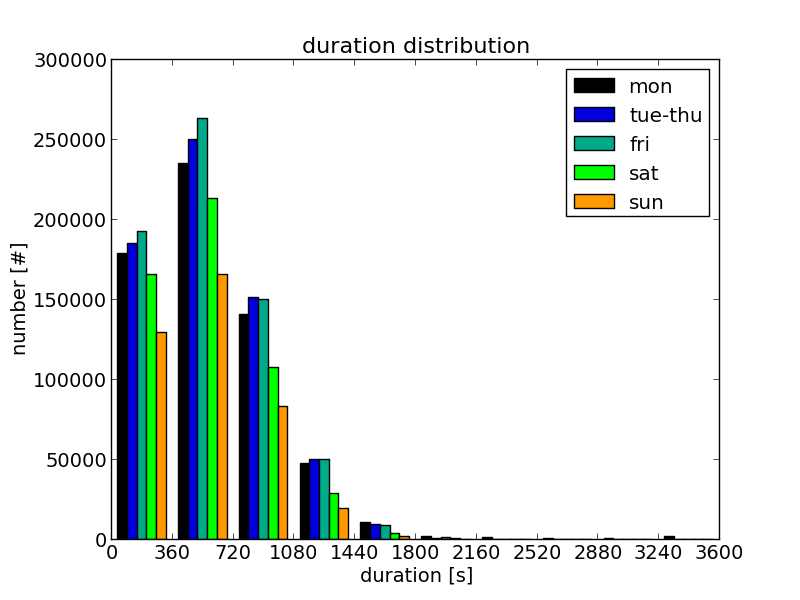 plot_tripinfo_distributions.py reads one or multiple tripinfo-files and plots a selected measure (attribute of the read tripinfo-files). The measure is visualised as vertical bars that represent the numbers of occurences of the measure (vehicles) that fall into a bin. 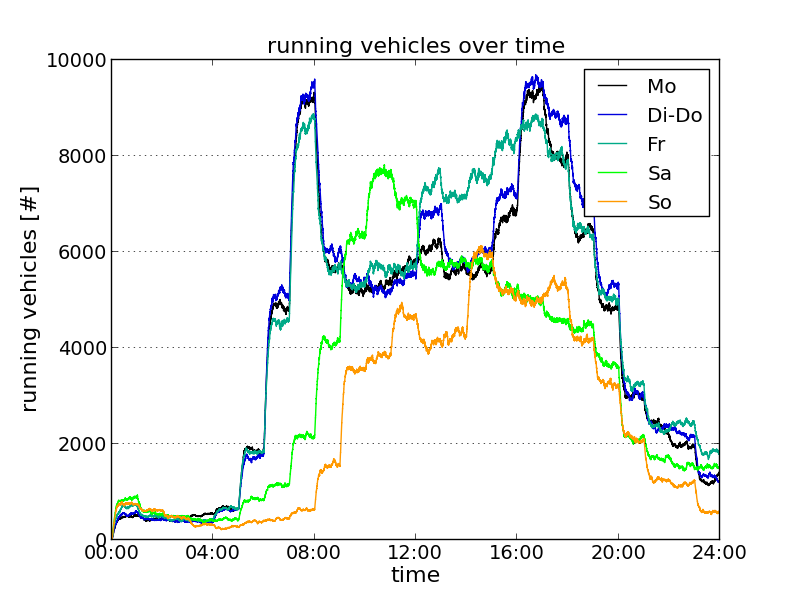 The example shows the travel time distribution for the vehicles of different week day classes (Braunschweig scenario). "mo.xml", "dido.xml", "fr.xml", "sa.xml", and "so.xml" are tripinfo-files resulting from simulations of the weekday-types Monday, Tuesday-Thursday, Friday, Saturday, and Sunday, respectively. plot_csv_timeline.py reads a .csv file and plots columns selected using the --columns <INT>[,<INT>]* option. The values are visualised as lines. 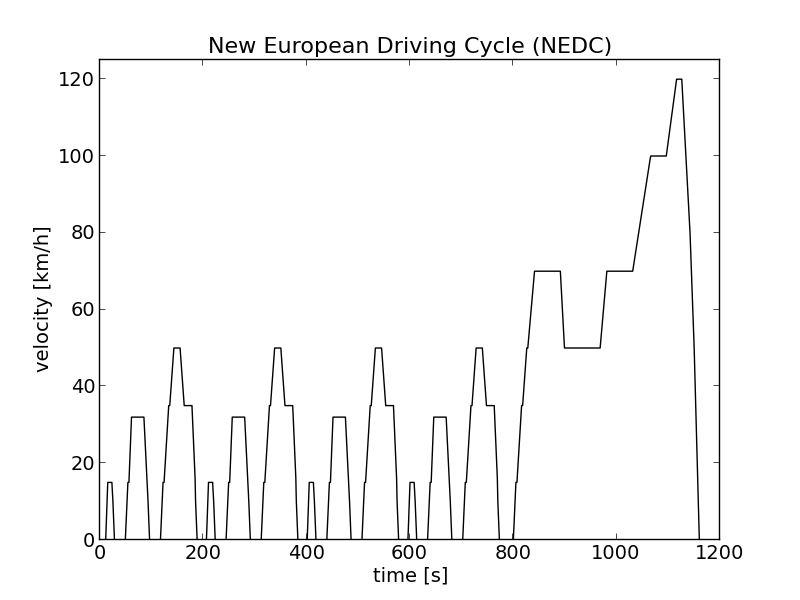 The example shows the New European Driving Cycle (NEDC). plot_csv_pie.py reads a .csv file that is assumed to contain a name in the first and an according value in the second column. 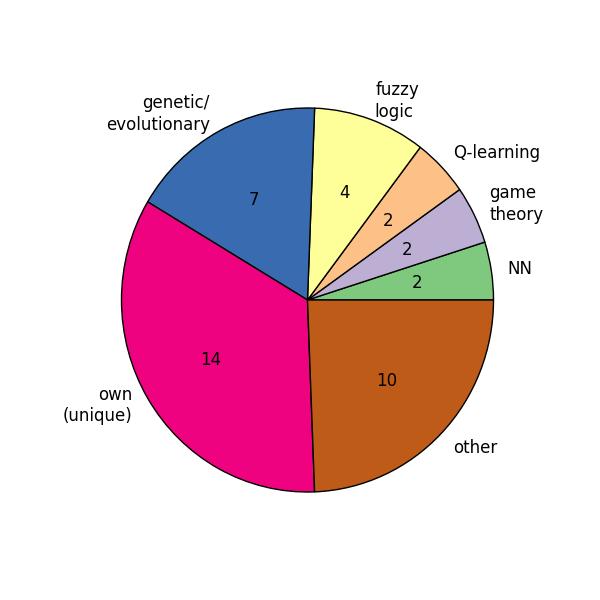 The read name/value-pairs are visualised as a pie chart. Please note that you should set the width and the height to the same value using the --size <FLOAT>,<FLOAT> option, see #common options. Otherwise you'll get an oval. plot_csv_bars.py reads a .csv file that is assumed to contain a name in the first and an according value in the second column. The read name/value-pairs are visualised as a bar chart. The options are listed and discussed in the following sub-sections, respectively. If one of the scripts is simply started with no options that are listed below, the figure will be shown. To write the figure additionally into a file, the filename to generate must be given using the --output <FILE> (or -o <FILE> for short). If the script is run in a batch file, it is often not convenient to show the figure (once known it is as it should be). In such cases, the option --blind (-b) can be used that suppresses showing the figure. SUMO-GUI can load weight files and show their values when setting edge coloring mode to by loaded weight. When stepping through the simulation, different time intervals contained in the weight file can be shown. Suitable weight files are those produced by edgeData-output. To show the number of departed vehicles for each edge, the option --weight-attribute departed would be used. 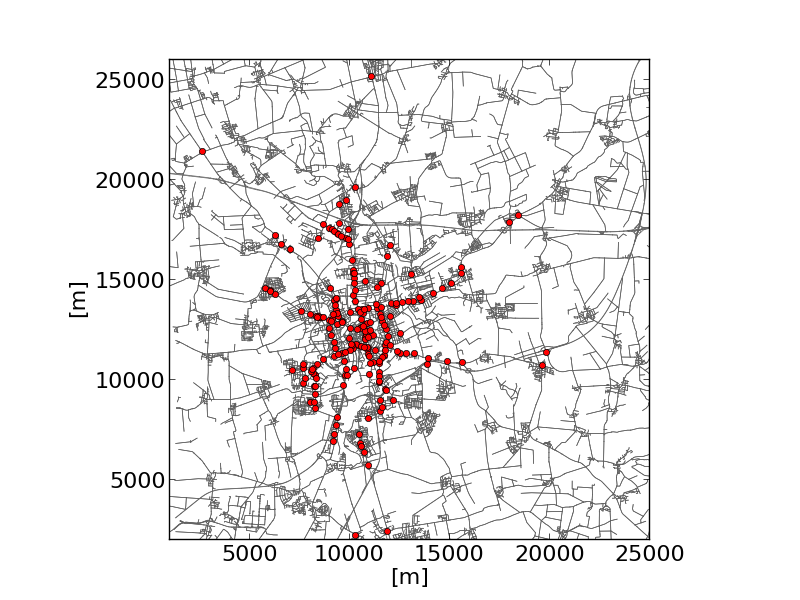 The weight files generated by randomTrips option --weights-output-prefix can also be used (to visualize depart/arrival probabilties). To visualize the flow on an intersection with line widths according to the amount of traffic, the tool route2poly.py can be used. 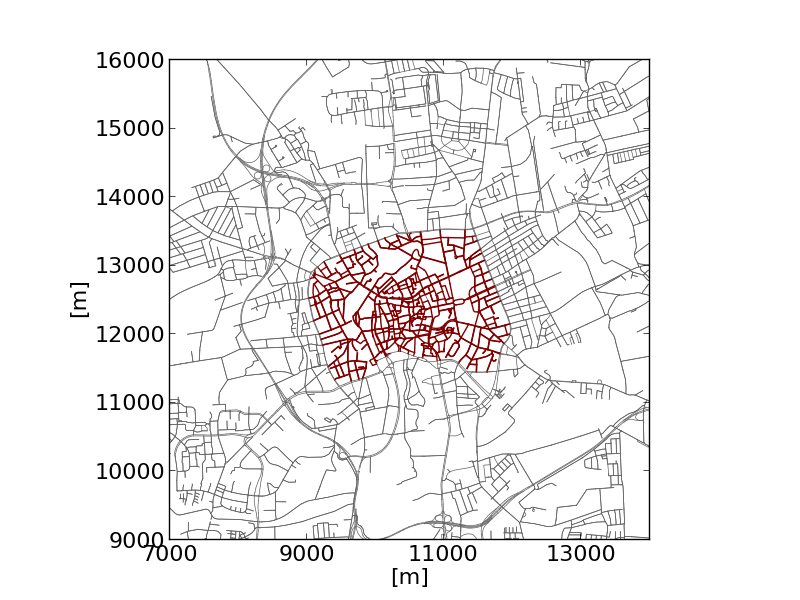 generate polygons with widths according to the number of vehicles passing the selected edges. When setting --scale-width to 0.01, 100 vehicles using the same edge sequence will correspond to a polygon width of 1m. The option --spread is used to prevent overlapping of the generated polygons and should be adapted according the the polygon width. Reads two dump files (mandatory options --dump1 <FILE> and --dump2 <FILE>, or, for short -1 <FILE> and -2 <FILE>). Extracts the value described by --value (default: speed). Plots the values of dump2 over the according (same interval time and edge) values from dump1. Either shows the plot (when --show is set) or saves it into a file (when --output <FILE> is set). You can additionally plot the normed sums of the value using (--join). In the other case, you can try to use --time-coloring to assign different colors to the read intervals. You can format the axes by using --xticks <XMIN,XMAX,XSTEP,FONTSIZE> and --yticks <YMIN,YMAX,YSTEP,FONTSIZE> and set theit limits using --xlim <XMIN,XMAX> and --ylim <YMIN,YMAX>. The output size of the image may be set using --size <WIDTH,HEIGHT>. Reads two tripinfos files (mandatory options --tripinfos1 <FILE> and --tripinfos2 <FILE>, or, for short -1 <FILE> and -2 <FILE>). Extracts the value described by --value (default: duration). Plots the values of tripinfos2 over the according (same vehicle) values from tripinfos1. Reads a value (given as --value <VALUE>, default speed) for edges defined via --edges <EDGEID>[,<EDGEID>]* from the dumps defined via --dumps <DUMP>[,<DUMP>]*. Plots them as time lines, using the colors defined via --colors <MPL_COLOR>[,<MPLCOLOR>]*. Please note that the number of colors must be equal to number of edges * number of dumps. Either shows the plot (when --show is set) or saves it into a file (when --output <FILENAME> is set). Reads a network (defined using --net-file <NET> or -n <NET>) and an edge-dump file (--dump <DUMPFILE> or -d <DUMP_FILE>}}). Plots the network using the geometries read from <NET>. Both the width and the colors used for each edge are determined using --value <WIDTHVALUE>,<COLORVALUE> where both <WIDTHVALUE> and <COLORVALUE> are attributes within the dump-file that exist for each edge. You can change the used color map by setting --color-map <DEFINITION>. <DEFINITION> is made of a sorted list of values (between 0 and 1) and assigned colors. This means that the default 0:#ff0000,.5:#ffff00,1:#00ff00 let streets with low value for <COLORVALUE> appear red, for those in the middle yellow and for those with a high value green. For values between the given values, the color is determined using linear interpolation. Please note that only lowercase hexadecimal characters may be used. --join sums up the values found for each edge and divides the result by the number of these values. If join is not set and --output is given, one should choose an output name which looks as following: <NAME>'%05d.png. The %05d will be replaced by the current time step written.